Professor Alistair Paterson is an ARC Future Fellow in archaeology at the University of Western Australia. His research examines the historical archaeology of colonial coastal contact and settlement in Australia’s Northwest and the Indian Ocean. 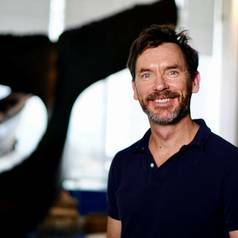 His key interests are Western Australia and Indian Ocean history, Aboriginal Australia, Dutch East India Company, colonialism and exploration, rock art, and the history of collecting in Western Australia in collaboration with the Western Australian Museum, State Library, Art Gallery, and the British Museum. He is lead CI on several ongoing ARC projects: (1) Collecting the West: Reimagining Western Australia from its collections; (2) Coastal Connections: dynamic societies of Australia's Northwest frontier and (3) Shipwrecks of the Roaring Forties: A Maritime Archaeological Reassessment of some of Australia's Earliest Shipwrecks, and a CI on (4) Murujuga: Dynamics of the Dreaming. He is the author of A Millennium of Cultural Contact (Left Coast, 2011), The Lost Legions: Culture Contact in Colonial Australia (Alta Mira, 2008) and editor with Jane Balme of Archaeology in Practice: A Student Guide to Archaeological Analyses (2nd edition, Blackwell Publishing, 2013).